I told you in a previous post that me and Dan have started looking for tiles for Number 18. We’ve spent a lot of time wandering around all of our local tile shops and some a bit further afield, hunting for tiles to go on the floor in the kitchen and utility, wall and floor tiles for both bathrooms and wall tiles to go above the units in the utility. We are still in the process of getting all of the tiles, but we’ve made decisions on what we want. Ok, I tell a lie – I’ve decided what I want. I’m lucky that Dan, in the main, leaves the interior design part up to me. For the utility wall tiles, I decided I wanted something relatively plain and also fairly cheap. I then saw a picture of metro tiles and realised they were the exact thing I was going for. What I didn’t like was the average £40 a metre price tag they seemed to attract everywhere we looked. The utility is an area I planned to save money, not go mad. As you can imagine the savings pot is rapidly depleting, so every penny counts! A few weekends ago whilst out searching for reasonably priced tiles, I stumbled across a clearance section. We had a mooch around, not really holding out much hope to find anything, but we were in luck. For £8.50 a square metre, there were the metro tiles I’d been hunting for! 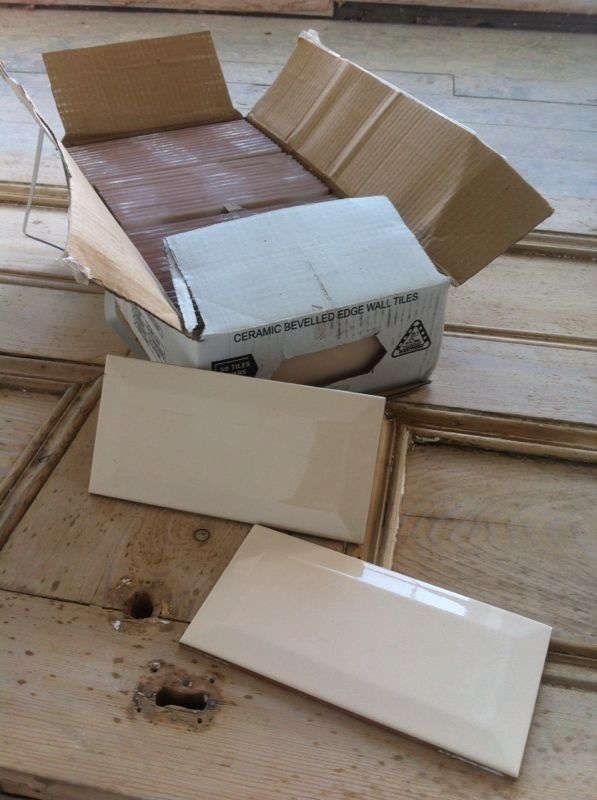 Two metres squared of tiles was enough to do the job, and have spare for breakages. At 17 bucks it was decision made. Don’t you just love a good bargain! ?